Students will be able to calculate the period and frequency for an object exhibiting periodic motion. Students use pendulums to observe and collect data on periodic motion. 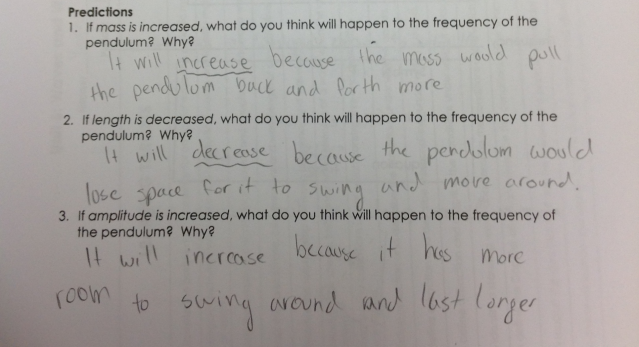 The goal of this lesson is to introduce students to periodic motion through looking at period and frequency of pendulums. The students get a brief introduction of what period and frequency are before they complete a lab where they find how frequency is affected by different characteristics of a pendulum. This lesson helps students practice their skills of predictions of how variables effect each other (SP1), carry out an experiment (SP3), use data to calculate period and frequency and finally analyze those data to draw conclusions about the effects of variables on frequency (SP5). The lab will help students to begin understanding frequency leading to the accomplishment of HS-PS4-1. To start out the week of class, I have students move to their Physics Families (cooperative base groups). Since it is the beginning of the week, I ask students to talk with their groups about the best thing that they did over the weekend to get them to start talking. After a few minutes have passed, I gather their attention to the front where I have two bins: a bin of puzzles and a bin of blindfolds. Students should remember this activity from the beginning of the semester where we worked on our communication skills. This is now an opportunity to see how well they have developed as a group. I ask students to select one person in their to be blindfolded. This person is allowed to touch the pieces, but not allowed to talk. The remaining members of the group are not blindfolded; they are allowed to talk, but not to touch the pieces or the person's hands, arms, etc. I tell the groups that the first group to have the blindfolded person complete the puzzle wins and gets to put certificate on the Physics Family wall. After Physics Families, students return to their seats and I pass out the new packet for the unit on waves. I ask students to look at the Unit 6: Waves Learning Target Sheet on the front of the packet. As they read through the learning targets for the first time, I ask that the students rate where they think they are in terms of being able to accomplish each target on a scale of 1-4. The detailed rating process is something we've done throughout the year (see the same activity from the beginning of the school year.) I do this activity so students can preview the unit and see what they are expected to be able to do by the end of the unit. I also do this so that when students rate themselves at the end of the unit they can see growth. When students have finished reading through the learning targets, I tell them that we will be focusing on the first learning target for the rest of the lesson. I ask them to turn to their Period and Frequency Notes so we can get a glimpse of what periodic motion is before we look at them in action. For these guided notes, I have my copy projected on the screen and my students follow along as we discuss the different topics. I start out with what periodic motion is. I ask students if they have every heard the word periodic and what does it mean? They tell me that it means something that is recurring so I use that information to help me define periodic motion. Then we look at the three important aspects of period motion: frequency, period and amplitude. Before I go into the physics terminology and definitions, I ask my students to tell me what they already know about they words to help them see that most of the definitions are similar. Then I lead them through what period and frequency are including the definitions, symbols, units and formulas. The formulas that I provide them are frequency = # of cycles/time and period = time/# of cycles. After we have finished both period and frequency, I ask my students to look at the formulas and tell me how they think period and frequency are related. We come to the conclusion that they are inversely proportional. To end the notes, I define and draw a picture of what amplitude is so that students can see how it is applied to a pendulum, as they need that information to complete the upcoming lab. After the notes, I ask students to turn to the Pendulum Lab in their packets. In this lab, they investigate how different variables effect the frequency of the pendulum. Before they collect data, I walk students through the predictions by showing them how the situation would change but not setting the pendulum into motion. 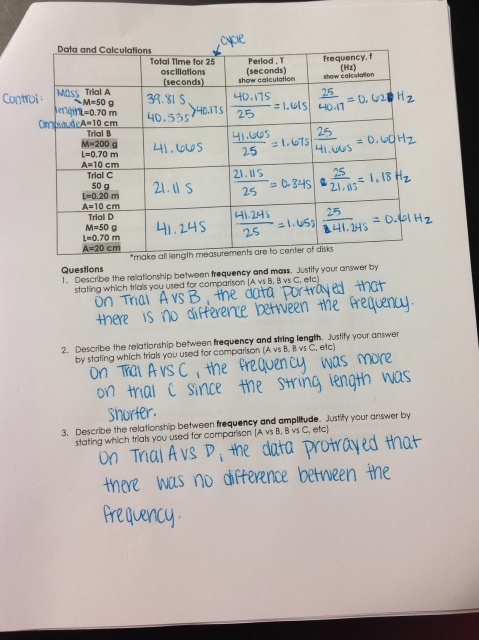 The three variables that students investigate are mass, length and amplitude. A few student predictions are shown below. Once students have completed the predictions, I explain the process of Pendulum Lab (on the back side of the sheet). We begin by examining the data table with the different trials listed. I explain that Trial A is the control so when students compare the trials later on they must compare the trial with trial A to see if there is a difference. Then I go over how to measure the length vs. the amplitude of the pendulum so they are accurate as they complete each trial. If students don't have any questions, I have them move to the back of the classroom where the materials are in a bowl at each lab table. For this lab, students receive a piece of string, a stopwatch and masses (2 of 50g and 2 of 100 g). When students are collecting data, they need to find the time it takes for their pendulum in each trial to make 25 oscillations (or back and forth motions) as shown in the video below. After they collect the data, students can use them to calculate frequency and period of the pendulum in each trial. They can then use the frequency data to answer the questions that allow students to draw conclusions about the relationships of the variables to the frequency of the pendulum. Students use this data and questions for a discussion in the next class. 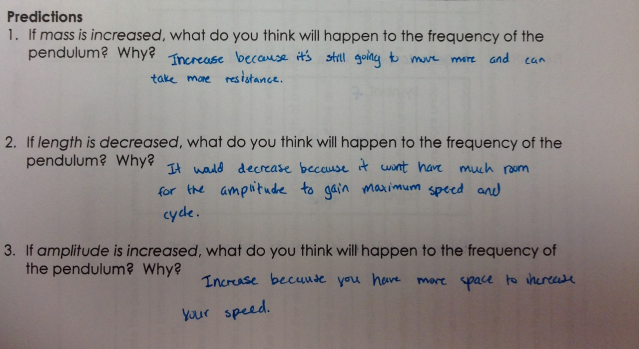 For homework, I have my students work on the Period and Frequency WS. This worksheet gives students practice with calculating period and frequency from some word problems and practice in understanding period and frequency conceptually. I give this as homework because this is a basic concept that we build off of with other ideas later in the unit. I want them to be able to practice them on their own, not in groups in class.